Several U.S. senators, including Marco Rubio and Bill Nelson, have called for fresh sanctions to be imposed against the Nicaraguan government. 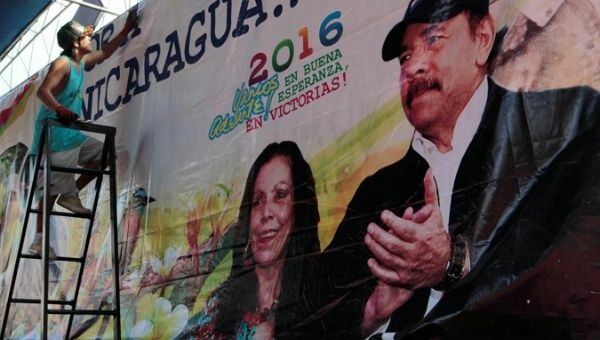 June 29 (teleSUR) The United States is calling for increased pressure and sanctions on Nicaragua, revoking the visas of several officials, as Nicaraguan Vice-President Rosario Murillo reiterates the government’s commitment to peace. “The U.S. Department of State revoked the visas of more individuals responsible for abuses against human rights and/or for undermining democracy in Nicaragua,” a statement said, without specifying which officials were sanctioned. Several U.S. senators, including Marco Rubio and Bill Nelson, have urged U.S. President Donald Trump to impose sanctions on the Nicaraguan government for ‘corruption and human rights violation.’ Rubio has close ties with opposition forces in Nicaragua, having earlier this month met with student leaders involved in the protests. Meanwhile, Nicaragua’s Vice President Rosario Murillo reiterated on Friday the government’s commitment to dialogue and peace, and asked that international entities condemn the violence of opposition groups that has virtually halted the country in recent months. “The commitment of all of us is to move forward, always with the people, constructing victories for the common good and for peace in Nicaragua,” Murillo said. Violent protests by armed groups have shut down transportation and economic activity in many parts of the country for the past two months, causing numerous deaths, injuries and damage to public and private property. In response to increased pressure by the United States and Nicaragua’s right wing, Venezuela told the United Nations Human Rights Council that a campaign to stage a coup was being waged in Nicaragua. “We reject that the topic of human rights is being used to attack Nicaragua. We call on the people and governments of the world to reject the violence and terrorism in Nicaragua and to support the inclusive dialogue promoted by the Sandinista government,” Venezuelan Ambassador to the United Nations Jorge Valero said.